I’ll confess, I missed the original tidal force of Necromunda. That is to say I never touched it at all, not once. It was mentioned in passing by my peers and fellow wargamers and did sound sensationally appealing. My biggest issue was the models, for me at least, have not aged well. 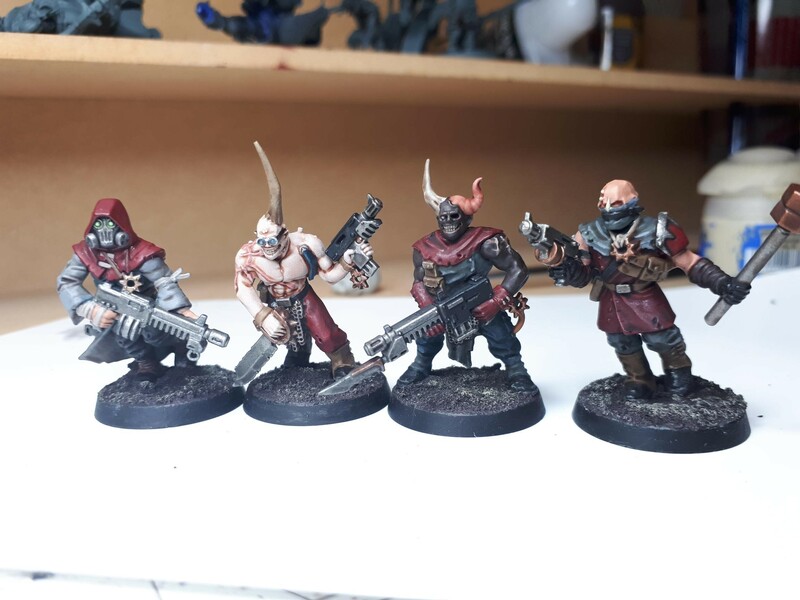 With the exciting revival via Necromunda Underhive I have been hankering for a Chaos gang! 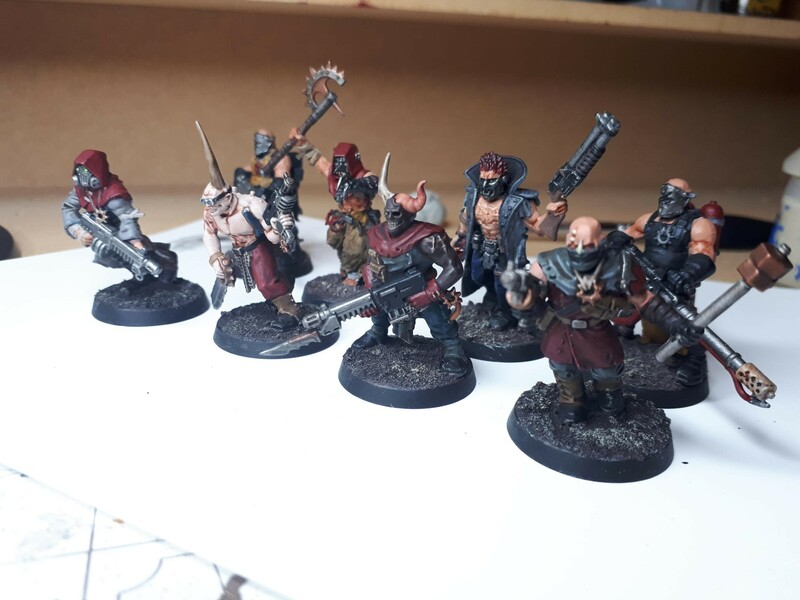 Chaos Cultists finally got some rules hot off the back of the Genestealer Cults getting theirs the previous month. I took this as the sign I needed to dive right in since I’m a long-time Chaos fan. I figured it’d be fun to run through my gang and their antics in a few articles. I’m sure there are plenty of people out there unsure if the game is for them so maybe my adventures may sway you to give it a go. Who are the Eight-Fanged Spiders? The light from the God-Emperor is said to reach every corner of the galaxy. Then why is it that light hasn’t reached the sewage subsection of Sector-47R in decades? Long has this particular part of the Underhive descended into dastardly and nefarious goings-on. To reach adulthood in this sector is seen as a blessing but not from the Golden Throne. For in this part of the work-hubs, other deities have sowed seeds. A prevalent gang within this waste-treatment environment is known as the Eight-Fanged Spiders. They have been surviving and managing countless acts of deviancy for many years, rising as the prevalent power within the sector. However, their time has come to rise from the putrid and feculant hubs in which they squalor. They seek to extend their reach by spreading the sacred Word. Should they not be silenced then their ultimate objective will be realised. They will offer the populace of the world to their gods of Chaos. Truly, the light of the Emperor has been extinguished here, replaced by the insatiable hunger of thirsting gods. 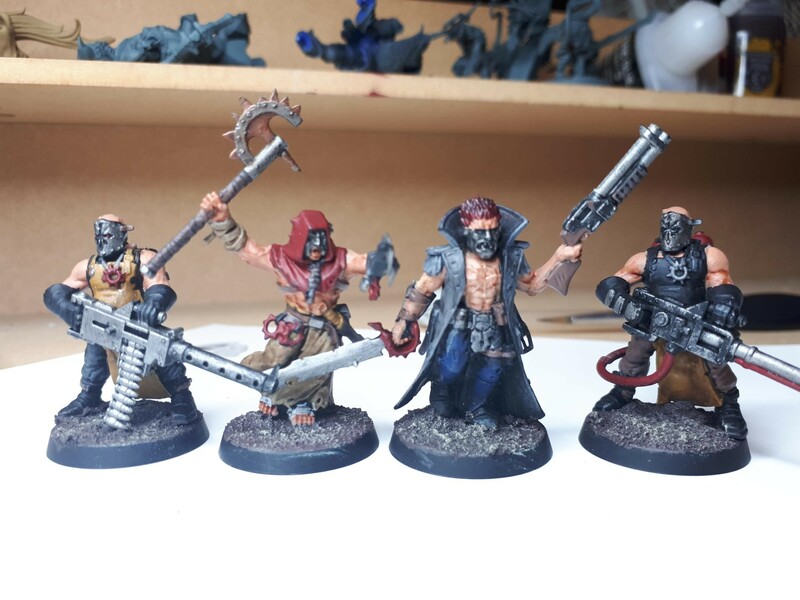 Below are images of my Chaos gang of cultsts, carrying various bits of kit to help them preach the Word. Some of these I painted back in 2012, when I was a little less…”skilled” with a brush. I intend on revisiting them though, should be a swift task. These are the four new additions to the gang that I built and painted last week. From left to right we have Farghast, Alyx, Sinok and Jirah. These guys I got with Dark Vengeance and painted in 2012. They’re due another go with the brush, I feel. Left to right we have Antaban, Chenrah, Davrax and Ruduk. I’ve gone for a bit of a balance of range and close combat, whilst sacrificing Flak Armour for most of them. This may well cost me some cultists, but frankly this will help to show my gang the cost of failure! The Dark Gods will surely provide divine intervention from incoming volleys…right? Otherwise, with a Heavy Stubber and Heavy Flamer thrown in via my Disciples, it should be a fairly balanced gang. For the Wych, I might go for the Scouring for the starting power. It seems fairly fun to use and would be great to set some foes ablaze in the dark confines of the Underhive. The gang together, ready to spread the Word via carnage, mayhem and disorder! I look forward to running my Chaos gang. I’m happy to finally be able to dive into Necromunda Underhive and see what antics I can cook up for Chaos! I will, of course, provide reports of my first findings with Necromunda and how my guys hold up against the other houses. What sort of gang do you run? Have you got any memorable moments from campaigns you might like to share? Let us know and as always, stick with TabletopGamesUK for more on all things tabletop and wargaming.